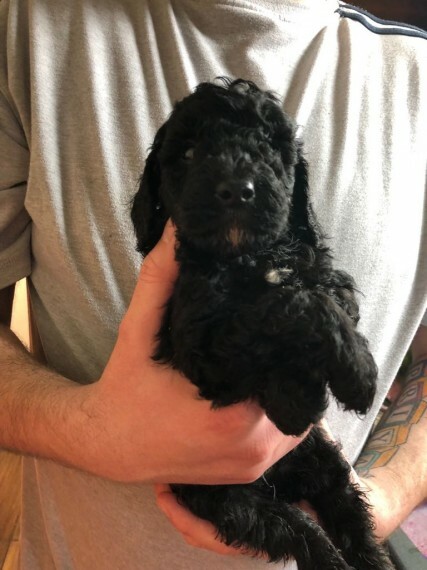 PRA clear F1b toy cockerpoo puppies. Mum is our spoiled F1 toy cockepoo and dad is a stunning kc register miniature poodle. Puppies will be wormed on panicure from two weeks old and every two weeks until they leave. Be vet checked and have there first injection and be microchipped. The puppies will be non shedding so great for allergy sufferers. Ready to leave on the 9th April. Non refundable 200 deposit secures pup of your choice. We have five puppies in total four boys and one girl. We have the following boys: Black 700 Apricot/ reds 900 And a female Apricot 950 Puppies bought up with my 17 month old daughter and used to washer dryer hoover noise etc. No time waster please.